Yea, though I walk through the valley of the shadow of death, I will fear no evil- Psalm 23. The shadows lengthened almost imperceptibly as the afternoon wore on, until the features of the younger man in the room were no longer clearly discernible. Ecthelion coughed loudly causing his son to look up. "We should send a thousand men," said Denethor. He blinked as the sinking sun dazzled his eyes. "You have not listened to a word I said," Ecthelion chided gently. "I was listening, father," Denethor protested. "I might be ninety- seven years old, but I am not yet in my dotage," the Steward replied. "I know when you are not paying attention, but how can I blame you today of all days. This discussion on the strength of the Ithilien Rangers can wait for another day." "Our routine should not be interrupted by the impending arrival," said Denethor. He sighed and rubbed the back of his hand across his forehead. "It has been too long, though. I was informed that second babies usually arrive much more swiftly than the first. I am eager to behold my daughter. Boromir will make a splendid watchful older brother to his little sister, who will be the fairest little maid in Gondor." "You could have a second son," Ecthelion cautioned. "Nonsense! Finduilas was much stricken with sickness in the morning this time, which she never was when expecting my Boromir. The healers told me to expect a girl and I assured Finduilas that I would not be disappointed with a daughter." "Boy or girl, as long as my grandchild is healthy and Finduilas is well, I shall be more than content," said Ecthelion. The old man reached for the cane he had needed since he had suffered a slight seizure the year before. He laboriously rose to his feet and went over to the window where he stood gazing out at the crimson hued sky. "It is a beautiful sunset tonight," he said. Denethor glanced towards the window. "It is no different from any other," he said. "It tells me only that day is almost done." "When you are as old as I am, my son, and you know that your days are approaching their end, you appreciate the small beauties all the more," said the Steward. "Speak not of your death so calmly!" Denethor said sharply. "You are of the House of Húrin, a true son of Númenor. You could yet live for many more years." "I do not fear death," said Ecthelion. "I rejoice, though, that I have lived long enough to see your children." Before Denethor could reply there came a knock on the door. "Come in!" both men cried almost in unison. A woman entered; her fresh complexion and rosy cheeks suggesting she was most likely recently arrived from the country. She was dressed in the black gown and white smock worn by the women healers." "What news?" Denethor barked impatiently before the woman had time to open her mouth. "You have a son, my lord, and such a fair babe, as fine as any I've ever seen. Not a large babe, but he has a right lusty cry and…." Denethor's face clouded at her tidings. "What of the Lady Finduilas?" he interrupted. "She is well enough now, but it was a long and hard ordeal for the poor lady. Dame Morwen almost despaired at one time, but both are well now and the Lady Finduilas is taking a little beef tea to strengthen her and…"
"I wish to see my wife," Denethor interrupted. "Of course, my lord. Mistress Morwen sent me to tell you that you can see your new son and the Lady Finduilas." Denethor rose to his feet. "I will come with you," said Ecthelion. "It is a long way for you to walk, father." "Nonsense, the exercise will do me good. It is the custom that the Ruling Steward should welcome each new heir into the world." "You have already welcomed Boromir who will rule after us both," said Denethor. "And I would welcome this grandson too." Ecthelion smiled at the woman who had brought them the news. "You lead the way, mistress, but not too swiftly, remember I am not as young as I once was. What is your name? You are not from the City, I wager?" "I am called Ioreth and I hail from Lossarnach, my lord. I am but lately come to the City to study with Mistress Morwen and…"
Her chatter continued until they reached Lady Finduilas' lying in chamber. As was the custom, Ecthelion waited in an antechamber while Denethor joined his wife and new-born son in the inner chamber. It was a dreary place to wait, dimly lit by a single torch burning in a sconce, the light from which barely penetrated the deeply shadowed recesses of the room. A servant bearing a lamp entered, alongside one of the healing women, who carried the infant in her arms. The lamp brilliantly illuminated the baby, bathing him in a pool of light. Ecthelion gasped. Boromir had been a sturdy babe, but this little one was, like their mother, nigh elven-fair. He had a sweet face with delicate features beneath a shock of dark hair and long limbs. He was smaller than Boromir had been at birth, but was perfectly formed. The old Steward was unexpectedly reminded of Thorongil. How he had hoped that his favoured captain might choose a wife and settle in Gondor. Surely, a son of his would have been elven fair, just like this tiny babe? Ecthelion reached out a finger towards the child, which was promptly grasped in the tiny fist with surprising strength. The baby gazed at him with a clear unblinking gaze, innocent, yet full of wisdom. Ecthelion was suddenly filled with an unexpected sensation of joy and hope. He blinked away a tear. Denethor appeared from the inner chamber. A refreshing scent wafted out of the door behind him. "Finduilas is resting," he said. "Mistress Morwen said it was a difficult birth, but that my lady should soon recover with rest and good food. So what do you think of your latest grandson, father?" "He is a fine child. Our beloved land will be in good hands." "We already have Boromir to secure our future." Denethor sounded angry and a shadow clouded his features. "Your pardon, son, I scarce know from whence my words came." He turned to Mistress Morwen. "My thanks for bringing my grandson to show me, Mistress Morwen. He is a fair babe indeed. Tell me, what is that scent in Lady Finduilas' chamber?" "It is kingsfoil, my lord. Mistress Ioreth says they use it in Lossarnach to refresh the air in a birthing chamber." "Mistress Ioreth is quite a character," Ecthelion said with a smile. "At present, she seems to think her country lore is the answer to everything, but she is proving a competent assistant," said Morwen. Ecthelion lingered a few more moments contemplating his new grandson and stroking his soft cheeks and hair. At last, he said, "You should take him back to his mother now." The healer disappeared back into the inner chamber, followed by the servant. Ecthelion could not tear his eyes from the baby until they were out of sight. "Such a beautiful child," said Ecthelion. "It gladdens my heart to behold one so fair." "Compared with Boromir, I find this one somewhat ugly," said Denethor. "He is a scrawny infant and much smaller." "He will soon grow," said Ecthelion. "I believe he resembles Finduilas somewhat with her elven beauty and grace." "Beauty and grace ill befit a boy child," said Denethor. "Gondor needs warriors not dancers!" Ecthelion again thought of Thorongil, the mightiest of warriors who moved with the grace of a cat. Finduilas' brother Imrahil had much of his sister's grace in movement too and was a doughty fighter. "What will you call your son?" he asked Denethor. "My Lady and I had planned to call a daughter, 'Miriel' so that we would have two jewels. Therefore, we have decided on 'Faramir '." "Why not 'Miriond' for a boy?" "It would seem that I valued this second son more than my Boromir if I called him my 'jewel son'. Faramir will be a sufficient enough jewel, I hope." "'Faramir' is a good name for one whom I feel will prove more than sufficient," said Ecthelion. "Time alone will determine that," said Denethor. Baby Faramir thrived, but his mother recovered from the birth slowly. Her body healed, but the melancholy, to which she had often been prone in the past, held her in its thrall and seemed to drain the very spirit from her slender frame. The healers informed the Steward and his son that it was not unusual for new mothers to suffer from low spirits and that Finduilas simply needed time and rest. Ecthelion enjoyed spending time with his new grandson. The sight of the fair babe made him forget the aches and pains of his growing infirmities for a time. During that summer, the Steward was usually often to be found in either the nursery of or Finduilas' solar when his duties allowed. Finduilas, more often than not would sit in a chair by the window in her solar with Faramir asleep either in her arms or in his cradle at her feet. Ecthelion frequently found her gazing south towards her homeland with a look of longing on her fair face. Today, when he visited, though, he found his daughter by marriage looking out of a another window, one that faced east. She clutched Faramir so tightly that he wailed in protest, while tears streamed down her pale cheeks. "What ails you, my daughter?" Ecthelion asked in alarm. "The Shadow from the East grows ever stronger," said Finduilas. "My poor babies! What is to become of them?" "We should not abandon hope," said Ecthelion. "Maybe the King will return and lead us to victory." "If only he would come!" said Finduilas. She made a valiant effort to compose herself. She gently placed Faramir in his cradle, and began to rock it, all the while wiping her eyes. "Maybe Denethor could take me to visit the sea if the King returned and released him from his duties?" she said, her tone like that of an as eager little girl. "But pay no heed to my foolish words. I should like to see the White Tree bloom anew and Gondor at peace. These are but dreams, though. Perhaps we should hope instead that Captain Thorongil will return. He led us to a great victory against the corsairs. Maybe more might follow?" "I miss Thorongil," Ecthelion said wistfully. "He was a good friend to Gondor and to me." "I wish he could have seen Faramir," said Finduilas. "Maybe one day he will," said the old Steward. That night Ecthelion enjoyed a private late supper with Denethor. Finduilas had already retired to bed. "I visited Finduilas and Faramir today," said the Steward. "You never spent so much time with Boromir as a babe, father." Denethor's tone held a mild rebuke. "You were constantly at his side when your duties allowed. I had no wish to intrude," said Ecthelion. "It is Finduilas I wish to speak about to you, though. She is in very low spirits. I have spoken to the healers and they say a change of air would benefit her." Denethor sighed. "They tell me that too, but, alas, I cannot leave my duties to take her and the children to visit her kin in Dol Amroth. These times are too dangerous for her to go alone. Some of the healers have strange ideas, though. My lady is already in the fairest place in Arda. The healers should concentrate on brewing tonics to restore her health. If she misses her kinsfolk they are always welcome to visit her here in the City." "I am needed here. It is out of the question, father. The subject is closed." "I am your father, but I am also your lord," Ecthelion said sternly. "I still hold rod and rule here and the City will fare well enough in your absence. Your lord commands you, Denethor, to take your lady and sons on a visit to Dol Amroth." "As you wish, father." Denethor replied. "If you will excuse me." He strode from the room. Two days later, Ecthelion watched Denethor and his family depart for the coast. The old man found the extra duties that fell upon him in their absence drained his already meagre reserves or strength. Yet, he deemed his hard work a worthwhile sacrifice on Finduilas' return, for her step was lighter and colour bloomed in her cheeks once more. Summer turned to autumn and autumn to winter. The cold seemed especially bitter this year and seemed to seep into Ecthelion's very bones. However many furs he wore and however large the fire, the Steward found it hard to get warm. Faramir continued to delight the old man. Soon after Mettarë he learned to crawl and liked nothing better than to crawl around his grandsire's feet laughing delightedly when the Steward played peek a boo with him. Ecthelion would laugh too, something he had rarely done since Thorongil's departure. Sometimes, Boromir would join in these games for he was touchingly devoted to his little brother. The lively little boy quickly grew bored, though, and would soon go off to play with his wooden sword or toy soldiers. Ecthelion was always relieved, for although he loved his elder grandson, he found Boromir somewhat boisterous. Faramir, on the other hand, was a quiet, sweet natured baby who was surprisingly undemanding for one so little. Ecthelion became increasingly convinced that there was something special about the child. an unusually wise child, quick to recognise and remember faces and possessing strong powers of concentration for an infant. The babe would gaze intently at pictures in books held up to his face, his bright eyes following the images from one page to the next. He was also sweet natured and loving. He liked nothing better than to snuggle against his grandsire. Spring came at last, but Ecthelion's health did not improve with the warmer weather. He still dealt with official papers, but he rarely left his chambers. The slightest exertion exhausted him. The healers could do nothing and said old age was what ailed him, the one affliction for which there was no remedy. Ecthelion dismissed them, weary of their fussing. The old man found himself thinking more about the past. Sometimes it seemed only yesterday that he was a young man watching his own children growing. He had tried to be a good father, but it had not been easy. He realised now that he had made mistakes with poor Firiel. Her sisters seemed content enough in their lives though. Then there was Denethor. He had never been as close to his only son as he would have wished, but Denethor seemed to hold everyone at arm's length, including his own father. The old man sighed. Sometimes he thought that ruling Gondor was easier than ruling his family and that he had been more successful as a Steward than as a father. Ecthelion was aware that he was slowly dying. He was resigned to it. He had grown weary of being confined within an aging body and was ready to gladly receive Eru's Gift to Men. One thing troubled him, though, the fate of his beloved land. He had taught Denethor all he knew and his son was ripe to receive the White Rod from his hand, but battle hardened warrior and lore master, though Denethor was, Ecthelion feared that his son's pride might shadow his judgement. Unlike his father, Denethor shunned Mithrandir's counsels. Then what if Thorongil should return? Denethor would not welcome him as his sire had done. Faramir's first birthday fell in early May and Ecthelion was determined to attend his grandson's modest birthday celebrations He rejoiced to see the toddler's delighted smiles at his gift of a wooden horse, but afterwards he was exhausted. The next day, he sent for Denethor and entrusted the White Rod into his keeping. Denethor seemed torn between sorrow and delight on receiving the ultimate symbol of authority. "You could live for many years yet," he protested. "My son, I am ninety-eight years old. All that is left for me is to ask that you rule Gondor wisely and well until the king should come again." "I will," said Denethor, taking the rod and clasping it firmly in his hand. Ecthelion now spent most of his time sleeping, but at his request, Finduilas brought Faramir for a brief visit each day. The visits much cheered the ailing Steward. One morning, when Ecthelion awoke with a pounding headache and he felt as if the room were spinning. His body felt numb and unresponsive down one side and he could not speak clearly. When his servant drew back the curtains to let in the morning sunlight, the chamber still seemed full of shadows. Ecthelion tried to speak to the servant but could not form the words properly. The man hastened from the room. Denethor and a healer appeared soon afterwards. "I fear the Steward is dying," said the healer after a thorough examination. "He has suffered another seizure." "Have you no remedy?" asked Denethor. "He recovered two years ago." The healer shook his head sadly. "I fear not, my lord. The seizure is far more severe this time. All I can advise is that Lord Ecthelion is kept comfortable. I will prepare a draught. You should send for any family who might wish to make their farewells, my lord." The day passed in a blur. Ecthelion was aware of his weeping daughters at his bedside and a scared looking Boromir clutching his mother's hand. The little boy seemed veiled in shadow, as were Finduilas and Denethor. "Faramir?" Ecthelion muttered. "I will bring him," said Finduilas. Ecthelion looked up and saw, to his great surprise, his father, Turgon, standing beside his bed. His sire appeared as a man in his prime, just as Ecthelion remembered him from his childhood. "Come, my son," said Turgon. "It is time. Many are waiting to welcome you home. Your lady and your mother are eager to greet you, as is Firiel." "What of Gondor?" asked Ecthelion. He found he could speak clearly to his father. No one else in the room seemed to have noticed Turgon's presence. "I think you know Gondor's future is in good hands," said Turgon. "Behold!" Just then, Finduilas returned with Faramir in her arms. Unlike the others in the room, Faramir appeared to be surrounded by light. Suddenly, he was a child no longer, but a man grown. He was riding beside Thorongil along a path lined with blossom trees and everywhere was fair and green. "Father! You cannot leave us now," Denethor cried. "Not when Mordor's shadow grows ever longer!" Ecthelion wanted to tell his son that all would be well. With a might effort, he cried out, "Thorongil, Faramir, hope!" Turgon reached out his hand. Ecthelion grasped it. The Old Steward was enveloped in a glorious golden light as the shadows fell away forever. A/n. This story serves as a sequel to "An Unexpected Letter" and also refers to "A Sad Tale's best for Winter". 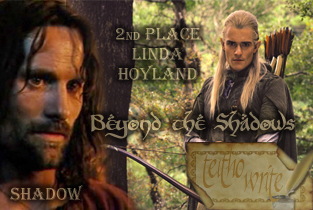 This story was written for the "Teitho" "Shadows" contest where it was placed second.